There's a reason we call it The Great Waters! Here you will find the most amazing collection of natural and manmade landmarks in North America. Where else can you explore cascading waterfalls, ancient lighthouses, turn of the century shipwrecks one day and the next visit the majesty and wonder of the Pictured Rocks National Lakeshore. Looking for more adventure? Paddle the Fox, the Tahquamenon, or The Mouth of the Two Hearted. Hike, ski, bike, or snowshoe the endless trails that run through the Hiawatha National Forest, Seney National WIldlife Refuge, or the awe inspiring Grand Island National Recreation Area. 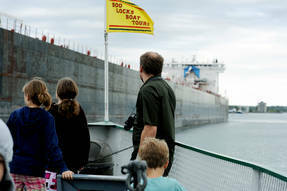 Get a glimpse of maritime history at the Soo Locks, where freighters, barges, tugboats and more traverse the 21-foot drop between Lake Superior and Lake Huron every day. The Soo Locks Visitors Center is open from Mid-May through Mid-October from 9:00 a.m. to 9:00 p.m. Located along the northern most shore of Lake Michigan!